Winter storms are starting to roll in off of the Pacific here in the Applegate Valley of Southern Oregon. In front are the zinfandel vineyards of Troon Vineyard, which were picked well before the rains arrived. Now all the fruit is harvested we more than welcome the rain. Punching down Troon Tempranillo in the rain under our old oak tree. Now it's night and most of me hurts and I'm exhausted, but tomorrow I will be up and ready to go as I know that my life with these wines will make the effort more than worthwhile. But why is there just me a 63 year old available for punch downs this morning? Welcome to the Applegate Valley where there's not an intern in sight. Welcome to winemaking on the frontier. 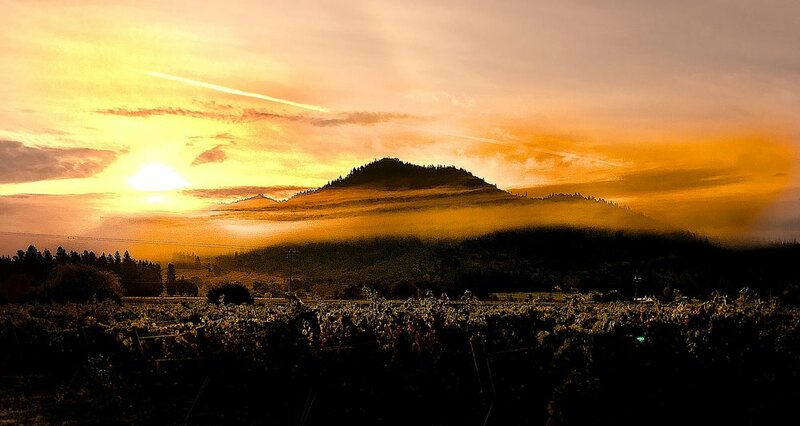 The Applegate Valley is an exciting, but emerging fine wine region and the niceties of established regions like the Willamette Valley or Napa Valley just don’t exist. As tiring and challenging as it is, the lack of accoutrements is also liberating. You are forced into choices that make you rediscover how natural the winemaking process truly is and that so many of the interventions used almost without thought in more established regions are unnecessary. You soon come to understand that these interventions are not only unnecessary, but detrimental as they strip wines of real character leaving pretty, fruity wines with indistinguishable personalities. When I first saw an optical sorter in the Napa Valley I was blown away. Out of one end came perfect grapes, looking exactly like blueberries, and on the side it discharged everything deemed less than perfect. My initial excitement slowly dissolved as I tasted the wines in barrel then bottle. What I thought was perfect fruit yielded wines that were one-dimensional. Those perfect grape blueberries ended up making a wine that tasted a lot like it actually came from blueberries. The strange thing about those perfect grapes is that they only look perfect. If they were truly perfect winemakers would not be forced to add acids, water and use enzymes and other additions to put back in what the optical sorter took out. At Troon there are no optical sorters in sight, nor in all of Southern Oregon as far as I know. All of our sorting is done during the pick in the vineyard. Instead of making wine with blueberries, we make wine with the grapes that nature gives us. That means along with those perfect grapes some are a little more ripe and some a little less. In the fermenter, together with the indigenous yeasts of the Applegate Valley, this varied fruit creates wine that is anything but one-dimensional. The grapes that are a little less ripe contribute vivacious natural acidity and those a shade overripe contribute body and richness - no additions required. Oh yes, and often we include stems in the ferment. In the tank it may not be pretty, but together they make wines that are alive. Wines that live make me feel more alive. The Troon Vineyard crew picking the grapes they grew. This is Vermentino bound for Troon Black Label Vermentino after a year in barrel. There's not much to it. You pick the grapes, crush them by foot, de-stem if needed and dump them in a fermenter. The fermenter, a one-ton macro-bin sits under the old oak tree behind the winery. After a few days the fermentation begins. Just like that. It seems so simple, so natural as we use no yeast, sulfur or acid additions as was the norm at wineries in my past. These interventions are not required by Mother Nature. Then it's hands-on punch downs every day and soon your hands are stained burgundy red. There is something different about this kind of winemaking. You are mentally and physically part of the wine. This is not a process, it's a philosophy, a way of life. You and the wine are connected. At Troon the same crew, the same people, tend the vines, harvest the grapes and make the wines. No sorting table is needed at harvest because the pickers are the same people that farmed each vine throughout the vintage. They only pick the perfect bunches, because these grapes are their grapes. They are harvesting a full year of work with each bunch cut from the vine. After years in the Napa Valley I was shocked at the deliberate pace of the pickers during harvest here at Troon in the Applegate Valley. 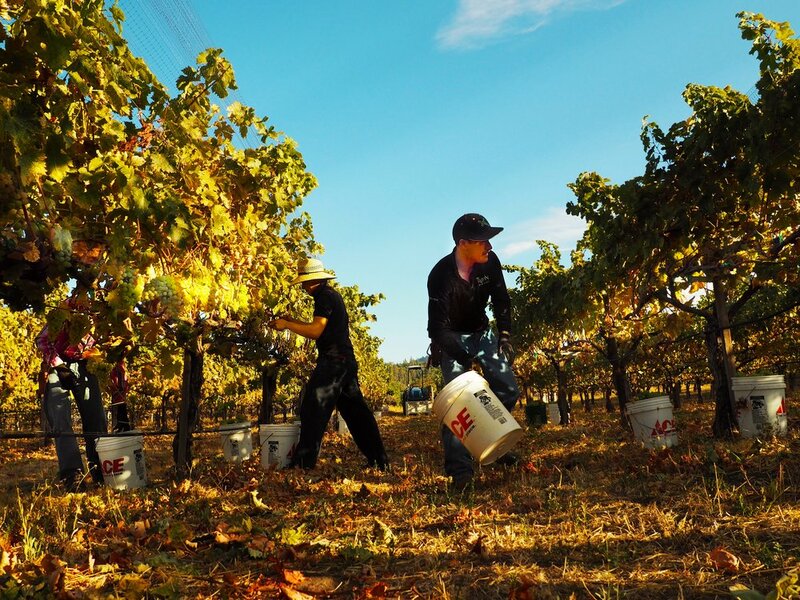 In Napa the picking crews are well-oiled machines and picking is at super-human speeds, which makes the pickers seem more mechanical than human as they surgically remove fruit from vine. Here in Oregon the picking pace is slower, but not any less work. Yet by dialing back the speed of picking the harvest seems to be the work of people, not machines. A picker that knows each row and vine treats the fruits of their year long labors with the respect that only sweat equity can understand. Their work needs no second guessing on a sorting table. The simple elegance of the process and the personal hands-on experience of growing and making wine this way cannot help but make you feel more connected. You are connected to the land, the vines, the wines, the people who make them and to the people who will drink them. Feeling this connection is the most rewarding feeling I've ever had in thirty-five years in the wine business. Wine should be a connection. It should connect the drinker with the land and people that brought the vineyard to life in a bottle of wine. This harvest I'm feeling very connected. Rain clouds roll over the Siskiyou Mountains with the Applegate River in the distance. In front are Troon Estate Vineyard Tempranillo vines. There's not enough rain to be causing us any real problems and harvest continues on schedule. Perfectly ripe Troon Vineyard Estate Vermentino ready to be harvested tomorrow morning.